Carrick Detwiler (left) and Clarence Waters are among the six University of Nebraska-Lincoln faculty chosen for named and university professorships from the Office of the Executive Vice Chancellor. 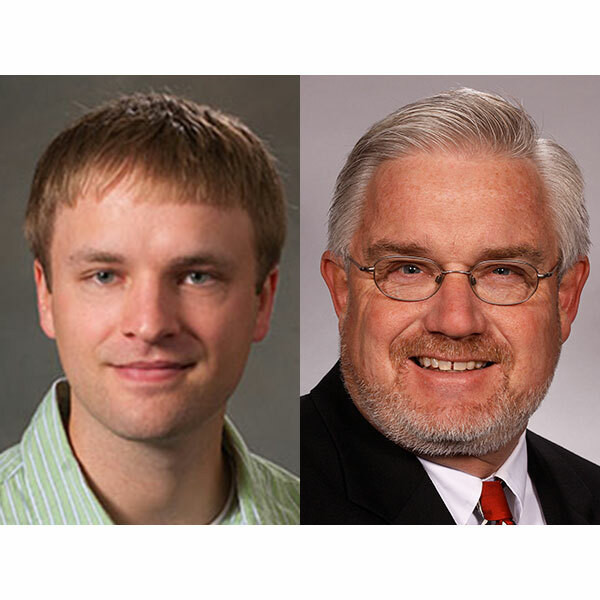 Engineering faculty Carrick Detwiler and Clarence Waters are among the six Univeristy of Nebraska-Lincoln faculty chosen to receive named and university professorships from the Office of the Executive Vice Chancellor during a celebration on Tuesday, Nov. 13. Waters was honored as Aaron Douglas Professor of Architectural Engineering, and Detwiler was honored as Rosowski Associate Professor of Computer Science and Engineering.